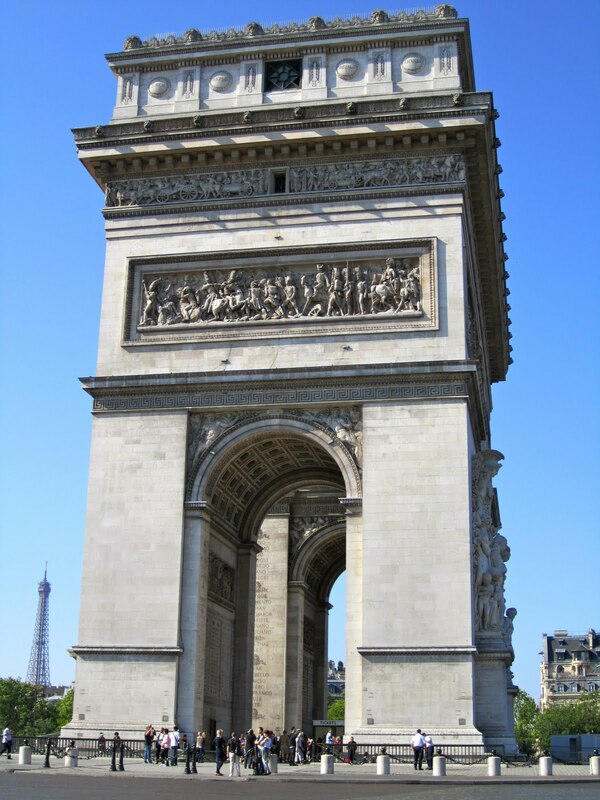 Wake up call at 8 a.m., ate breakfast, and then headed out with the group for the Champs-Elysees at 9. 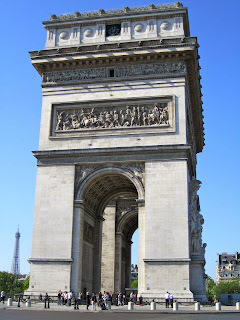 We started the day at the Arc de Triomphe- the group did its fair share of vogue-ing there. As we were leaving, I saw that Ken fell victim to a street vendor selling bracelets. After my encounter yesterday, I did what any reasonable person would do and tried to help him out of being swindled. As the man was putting a bracelet on him and I casually walked by and told him to take it off. As a result, Ken jerked off the bracelet pretty dang rapidly - then the vendor got really upset. Hence, I got cussed out for the first time in Paris. In English, nonetheless… He was quite proficient in his mastery of English profanity, I must admit. From there, we walked down the Champs-Elysees and saw tons of stores. Abercrombie and Fitch had the longest line by far- with its very own model as a ‘bouncer’. We then detoured to the Trocadero to see the Eiffel Tower. After seeing the “Old Lady” we jumped on a train. Destination: Notre Dame. 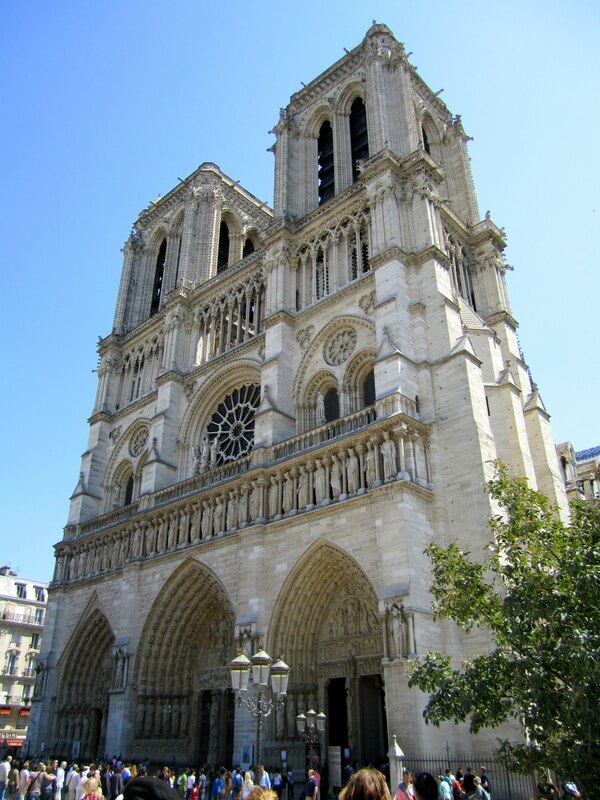 Notre Dame was a sight in itself. Immense stone pillars. Beautifully constructed stained glass windows. Towering wooden doors with whirls of iron designs. Gargoyles. Attention to every detail. After Notre Dame, we explored the Latin Quarter. From there, we walked for what seemed like for.ev.er… I was getting a headache from dehydration so I ended up buying a drink off a street vendor. Then, we lost Shane. Or... it was more like we discovered we lost Shane… We walked to towards the oldest square in Paris, place de Vosges- we viewed 18th and 19th century architecture and the University of Paris while en route. The architecture was absolutely stunning, and that side of Paris was more of the “real” Paris- less tourists and more Parisians hanging out/ going about their normal routines. The square was lined with shops with living quarters above- I stumbled upon one of my new favorite designers too. Also, let me mention that never have I ever seen so many people in a park so absolutely carefree. On the way out of the park, the group got split up and a little lost BUT we found gelato. And it was GOOD. I got a medium cone with amaretto, crème, and strawberry- cookie included on top. J’adore gelato= complete understatement. From, there we headed back to the hostel with miss Claire leading the way. The group discovered I sat in bird poop or some jazz like that on the walk back, so I implemented the use of my tide-to-go pen and threw on some skinny jeans. At the hostel we sat down for a split-second, headed to dinner (my table didn’t get any dessert but it was this flan jazz that they said we weren’t missing out on), and then away we went to the Eiffel Tower with Dr. Vedenov. LONGGG lines and CHILLY- but so completely worth it. I got a couple pictures and then my camera died. FML again. But nevermind that- because when I got to the top, it was absolutely spectacular. Sure, we’ve all seen pictures of/from the Eiffel Tower, but a single picture cannot capture what it’s like to see it with your own eyes. Not even close. LONG lines on the way down too- plus the chill of the wind gave us all a run for our money. Outside of the tower, we thought we lost Shane again… and Claire... Cue Dr. Vedenov’s heart attack #1. We heard the metro closed at 12:30- giving us all of 3 minutes to get to the metro stop- but it was open until about to 1 AM. Thank goodness. That saved us the cab fare- but not our tired legs or Dr. Vedenov’s heart rate and stress level. I collapsed into bed around 2 a.m. Great. day.